GENERAL ELECTIONS IN SOUTH AFRICA: 8 MAY 2019. Please note that EC English Cape Town will be closed for that day. 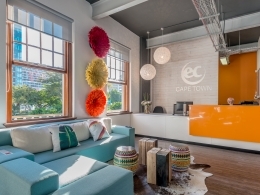 With a brand new designer finished school, in the heart of the city, EC Cape Town is just a few streets away from all the action of famous Long Street. The school is warm and welcoming with fantastic facilities and situated in a beautifully renovated heritage building. EC English Cape Town is registered as a Private College with the Department of Higher Education and Training (DHET) in South Africa. EC’s registration number with DHET is 2018/FE07/034. Just opposite Cape Town’s newest and tallest skyscraper, called Portside. Once I arrived, my host mum Ruwayda Toefy had already prepared a delicious breakfast. While enjoying the meal, she told me all about Cape Town, not only its dangers, but also places which are worth visiting. My host family really took care after me as if I was their own child. For instance, they would talk to me every day about how my day has been and I would always find my private room clean and neat. Although Bo-Kaap can be sometimes a risky place at night, I never felt uncomfortable when sleeping. Even if the host family was not at home, I would still have my room-mates to talk to. EC welcomed their new students with a dinner on the evening before school started. Taking into account that most of the students were travelling alone, this event was a perfect opportunity for them to make contacts and form friendships. If I had to describe EC in one word, it would be “family“. Since the first day, teachers and admin staff treat their students like their own family members, with a lot of love, kindness and helpfulness. You do not have to worry about visas, organising trips or moving houses, the school will assist you in any way. As a matter of fact, EC even helped me when I was struggling with South Africa‘s Customs for ordering practice books from abroad. I enrolled for the Cambridge CAE Preparation Course with Anthea as our main teacher. She never failed to attract our attention to the topic in question. By organising her classes very interactively and balancing working by ourselves and her direct teaching, she was able to provide us with the best preparation possible, in only ten weeks. I also highly appreciated it that Anthea was always ready to correct some extra work of mine no matter how much it was. All in all, I would highly recommend everyone who is thinking about making an English language stay, to choose EC Cape Town. Without a doubt, I am going to come back to prepare for my CPE. I am very grateful to all EC staff members for enabling me to have such an amazing experience in Cape Town. Hello, I’m Aaliya and I was born and bred in South Africa. I’m a passionate Capetonian who loves living in this diverse and colourful Mother City. English is my mother tongue and have been an EFL teacher for 10 years, having worked at various language schools in Cape Town, and also helped set up a unique English Language school in the city centre. I hold a CELTA certificate and have been a Director of Studies at two previous language schools in my EFL career. I currently prefer teaching since it allows me to meet new people from all walks of life and assist them along their English language learning journey thus exchanging stories and fond memories with students. Read, speak and communicate in English. Don’t be afraid to make mistakes – you will only learn from them…surround and immerse yourself in English. LIVE the Language! My classes are as fun and interactive as possible. I love creating a buzz in class with cool vocabulary activities, understanding and applying the grammar in real-life contexts and conversation exercises. I teach English to Foreigners as a global tool for Communication! I focus on communication; interaction and integration as a means to build cultural and social bridges through the medium of English. We are so lucky to have such beautiful beaches and mountains in Cape Town…so anywhere in nature suits me perfectly and also skateboarding along the beachfront. You can’t leave Cape Town without discovering Table Mountain! Welcome event for new students. Come and make some new friends! Journey around the Cape's beautiful vineyards. 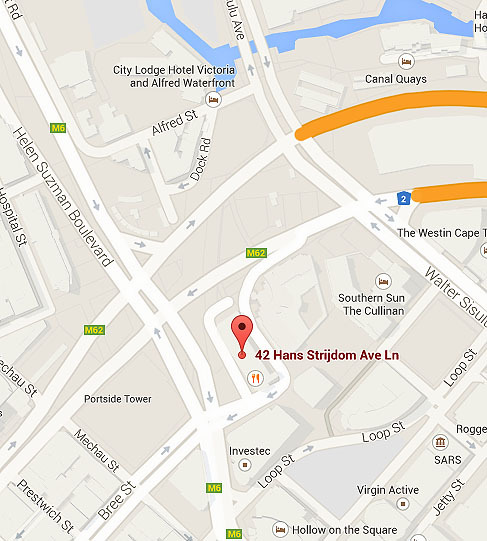 Cape Town's biggest shopping area. Visit all the sights of the city. Surfing in Muizenberg & Kalk Bay surfing lessons in Muizenberg-the famous surfers beach. Come and explore the wonders of the Cape peninsula. Full-day tour. Spend a relaxing day at this scenic spot.